Name given by Anglo-Saxons to the Christian Passover as the Feast of Resurrection, and rather incorrectly used for the Jewish Passover (Acts xii. 4, A. V.). Originally "Pascha," or "Passover," was the name given by the Christians to the fourteenth day of Nisan as the day of the Crucifixion, corresponding to the eve of the Jewish Passover, the season of the sacrifice of the paschal lamb; this was followed by the memorial of the Resurrection on the succeeding Sunday; the former was regarded as a day of fasting and penitence, the latter as a festival of joy. Under the first fifteen bishops of Jerusalem, who were all Jews, no difference occurred between the Jewish and the Christian dates. 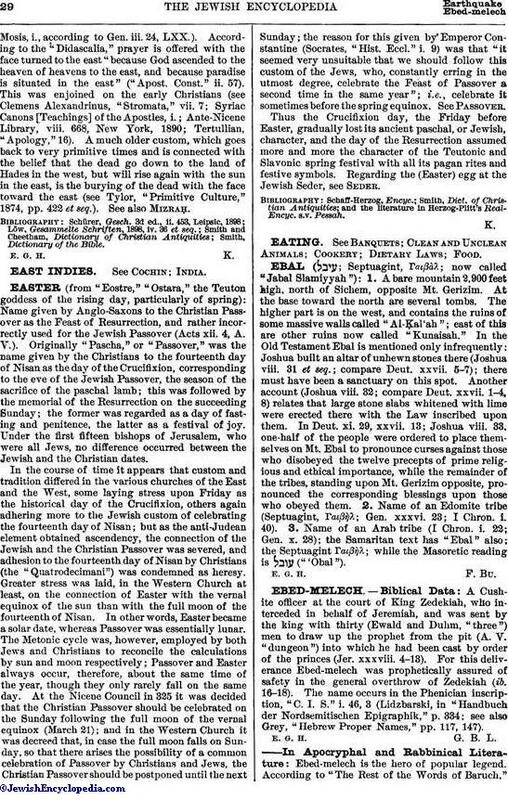 In the course of time it appears that custom and tradition differed in the various churches of the East and the West, some laying stress upon Friday as the historical day of the Crucifixion, others again adhering more to the Jewish custom of celebrating the fourteenth day of Nisan; but as the anti-Judean element obtained ascendency, the connection of the Jewish and the Christian Passover was severed, and adhesion to the fourteenth day of Nisan by Christians (the "Quatrodecimani") was condemned as heresy. Greater stress was laid, in the Western Church at least, on the connection of Easter with the vernal equinox of the sun than with the full moon of the fourteenth of Nisan. In other words, Easter became a solar date, whereas Passover was essentially lunar. The Metonic cycle was, however, employed by both Jews and Christians to reconcile the calculations by sun and moon respectively; Passover and Easter always occur, therefore, about the same time of the year, though they only rarely fall on the same day. At the Nicene Council in 325 it was decided that the Christian Passover should be celebrated on the Sunday following the full moon of the vernal equinox (March 21); and in the Western Church it was decreed that, in case the full moon falls on Sunday, so that there arises the possibility of a common celebration of Passover by Christians and Jews, the Christian Passover should be postponed until the next Sunday; the reason for this given by Emperor Constantine (Socrates, "Hist. Eccl." i. 9) was that "it seemed very unsuitable that we should follow this custom of the Jews, who, constantly erring in the utmost degree, celebrate the Feast of Passover a second time in the same year"; i.e., celebrate it sometimes before the spring equinox. See Passover. Thus the Crucifixion day, the Friday before Easter, gradually lost its ancient paschal, or Jewish, character, and the day of the Resurrection assumed more and more the character of the Teutonic and Slavonic spring festival with all its pagan rites and festive symbols. Regarding the (Easter) egg at the Jewish Seder, see Seder. and the literature in Herzog-Plitt's Real-Encyc. s.v. Pessah.